Dan had been planning this one for a few months. This was to be a paved road tour. It happend to coincide with ACA's National Bike Travel Weekend. 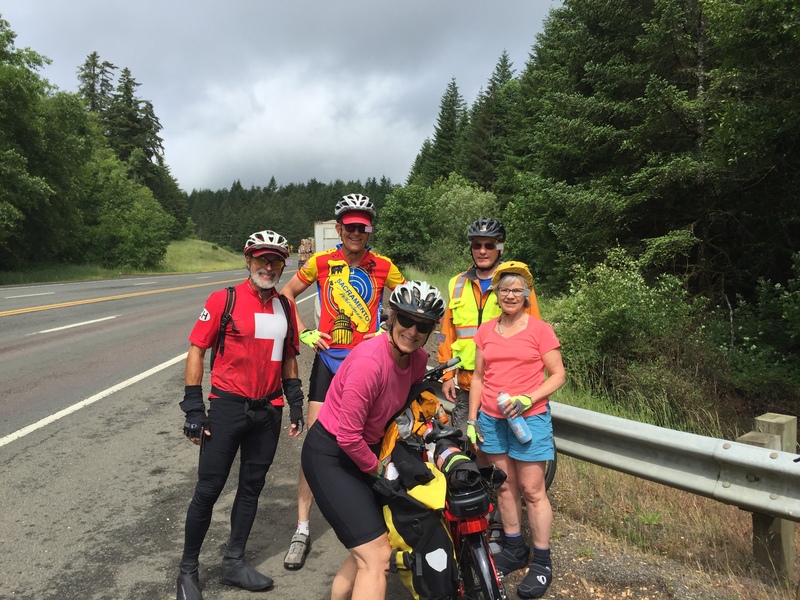 We would start out with 4 riders but we knew Eileen and John would be taking the bus home on Friday, leaving Dan and I to complete the loop. We hit the hottest weather of the year so far and it was perfect on the coast. I wish we were able to take a few more days on the coast, but Dan and I both had to be somewhere Monday morning. The last two days were hard, much harder than the first two, both due to the heat once we got off the coast, and the long climbs. 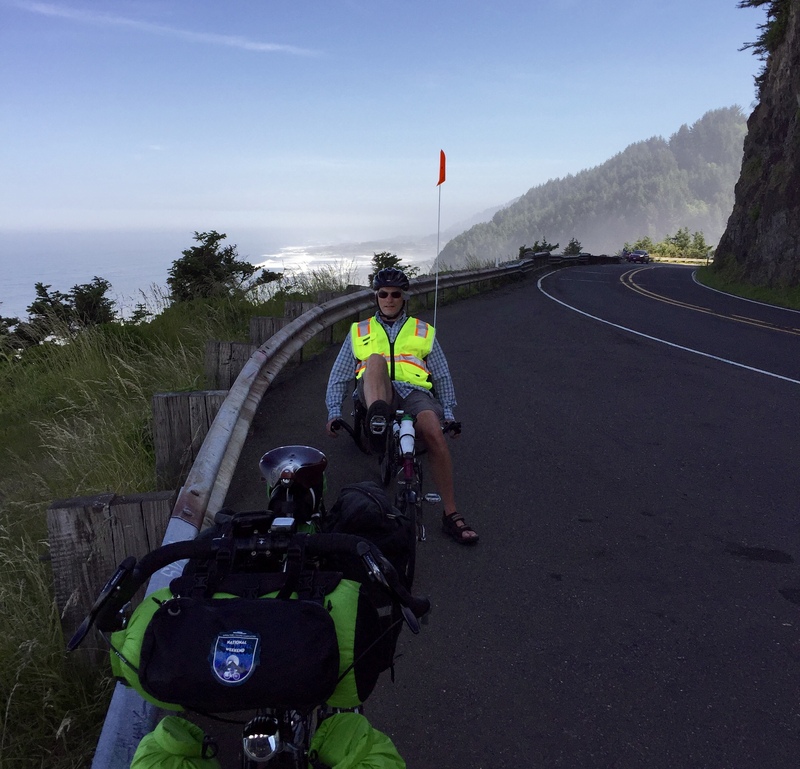 The climb from Cape Perpetua through the Coast Range was spectacular. 26 miles of mostly paved road and not one car. Increible views. Intense climbs, and thrilling descents through lush forest the whole way. On the ride out we were joined by a bunch of riders from Sacramento. They were doing a week long supported tour. I helped them plan the route to the coast. They continued on to Newport while we camped at Moonshine Park. Misty drippy stuff all day until we got to the park when the sun came out and it dried up nicely. Heavy dew made for a slow start while we dried the tents in the sun. Lovely ride to Newport. Almost hot. Lunch on the bay front. Then Eileen and John parted to catch the bus home while Dan and I continued. 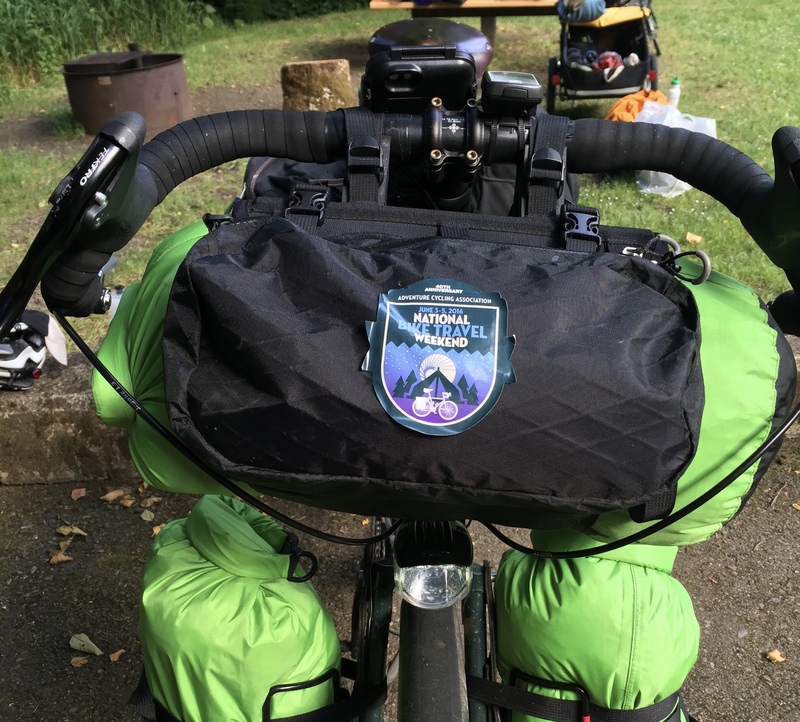 Met a couple from Canada that were riding to San Diego, then 3 young women from Canada who were riding to San Francisco, then camped with Tom from England who is riding to LA. 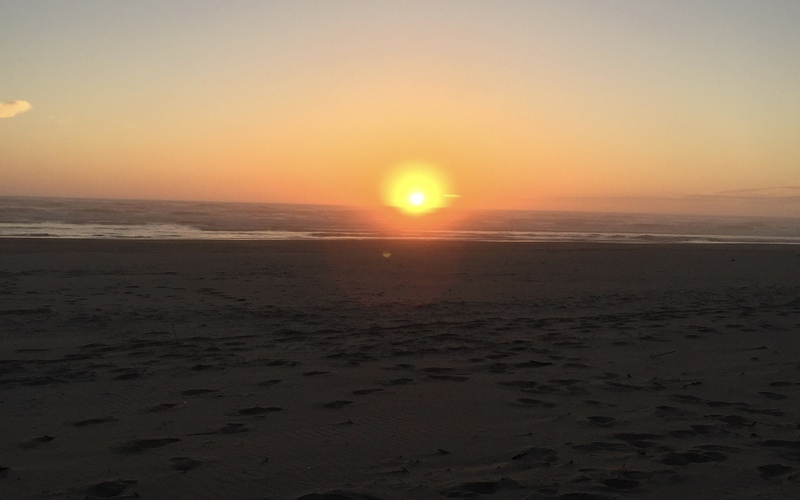 Tailwind from Newport, 73 degrees in Waldport. The crowds are tough on the Oregon beaches. The morning was gorgeous. Slight fog hanging in over the coast with warm sunshine already streaming through. 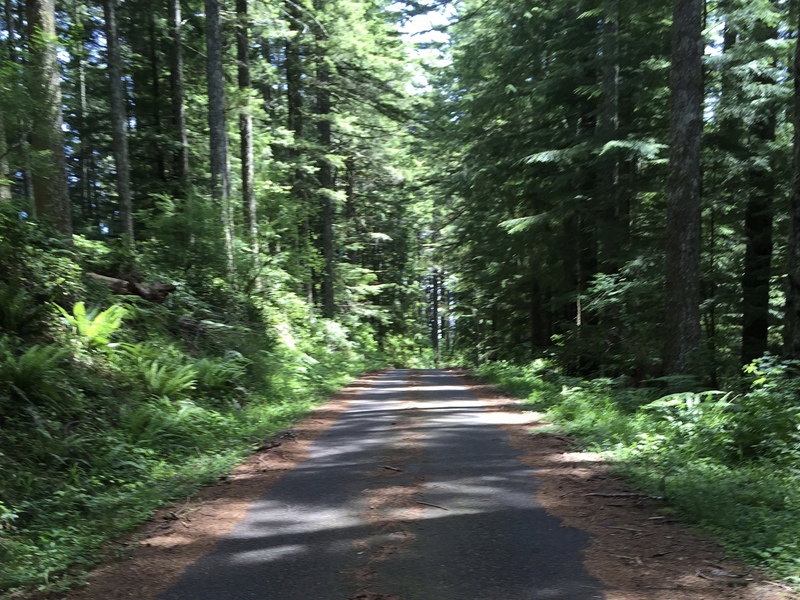 The approach to Cape Perpetua was so beautiful I had to shout out for joy. At the base of the climb we ran into the three young women from Vancouver we met yesterday. 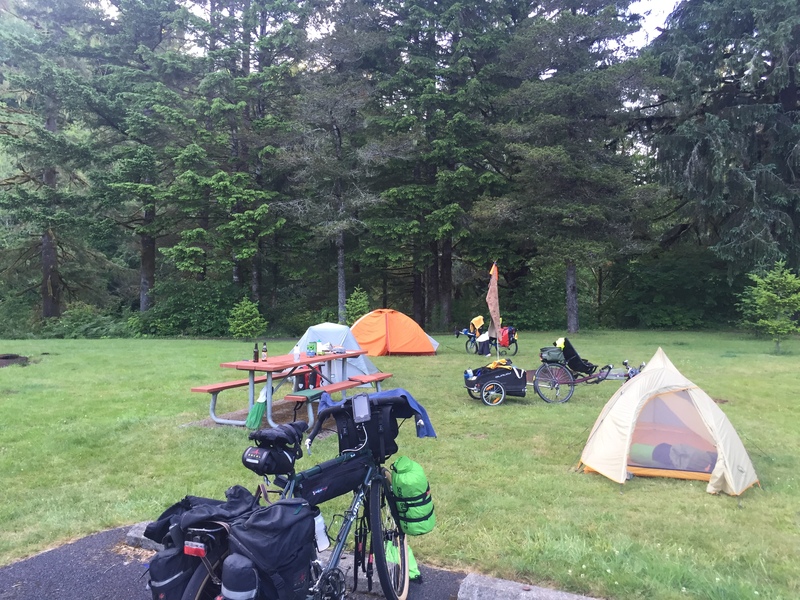 The camped at the FS campground at Cape Perpetua. It was steep right away. For kicks we passed the road we wanted and did an extra mile of climbing before turning around. Wish I knew the vertical. It was a lot. 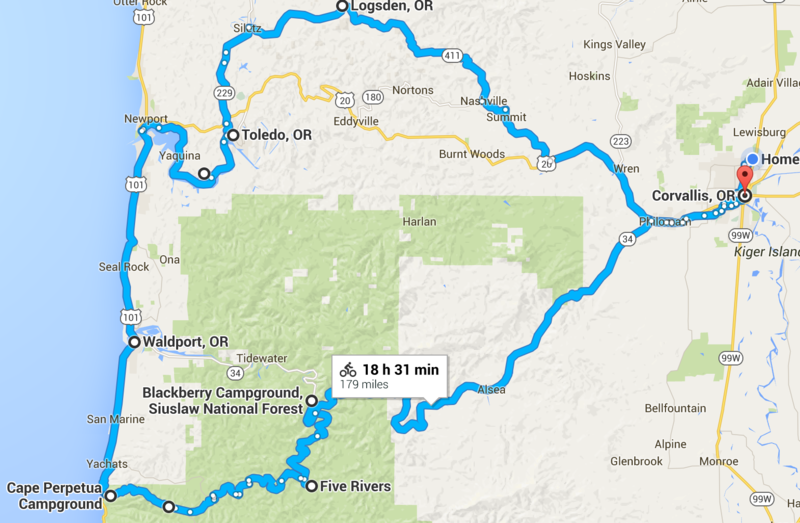 (Ride with GPS later told us it was 4,062') Huge climb from Cape Perpetua up Cape and Klickitat ridges. Incredible views looking across Yachats Valley to Mary's Peak. Very hot, but still pockets of cool air in the shady places. Man on Buck Creek said it got over 100. It took at least 6 hours to go the 26 miles from Hwy 101 to Five Rivers road. 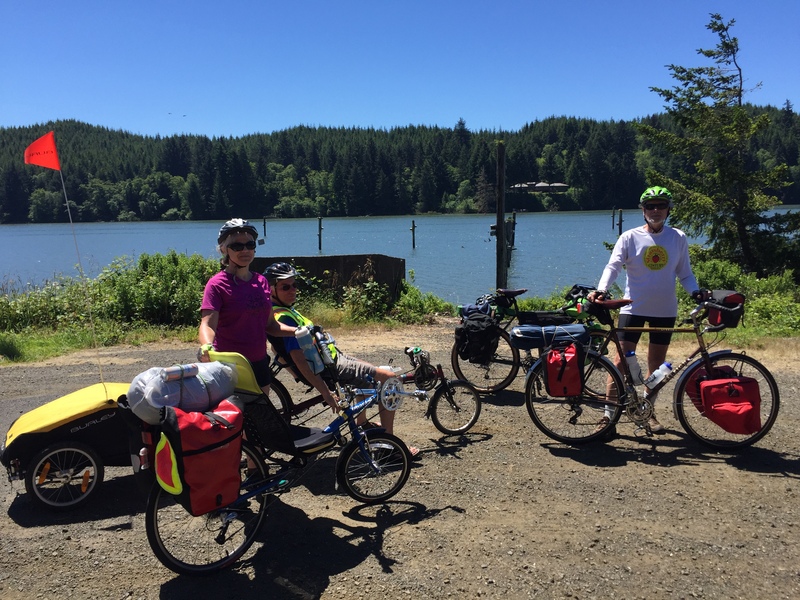 Too tired to make it to Alsea we opted to back track a few miles on Hwy. 34 to Blackberry Campground. Found a great spot right on the river and my Senior Pass got it for half price, $12. This picture cannot capture the glory that was the Oregon Coast on this morning. 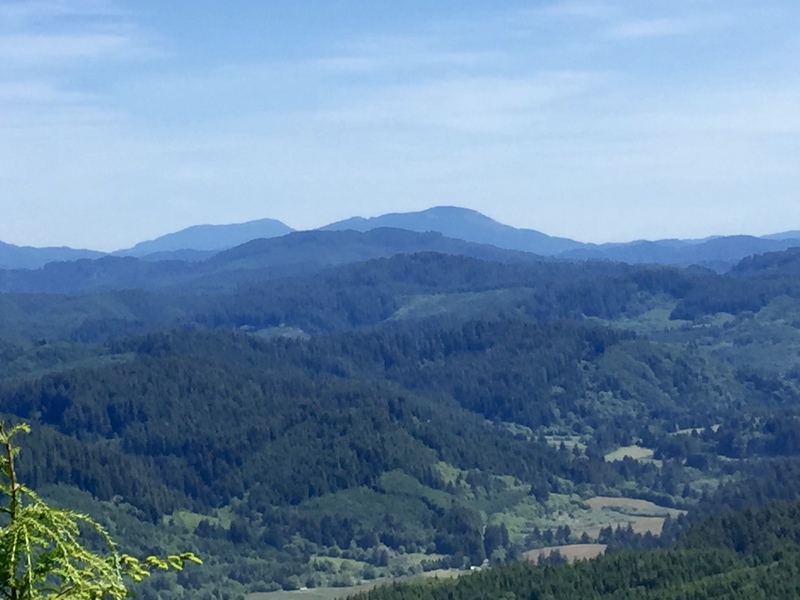 Looking across the Yachats River Valley towards Prairie Mountain and Mary's Peak. 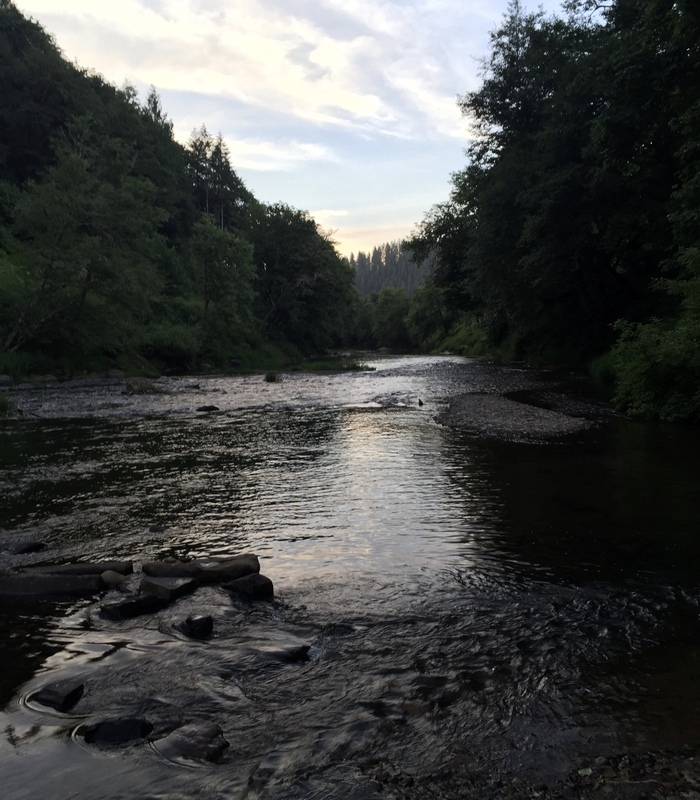 Back down on the Alsea River in the fading light. We took 34 the whole way. Hot. I got a flat. It got hotter. We had lunch at Deb's Cafe. It got hotter. We cooked. Stopped 4 times on the big climb in the shade to cool down. Made it home beat.